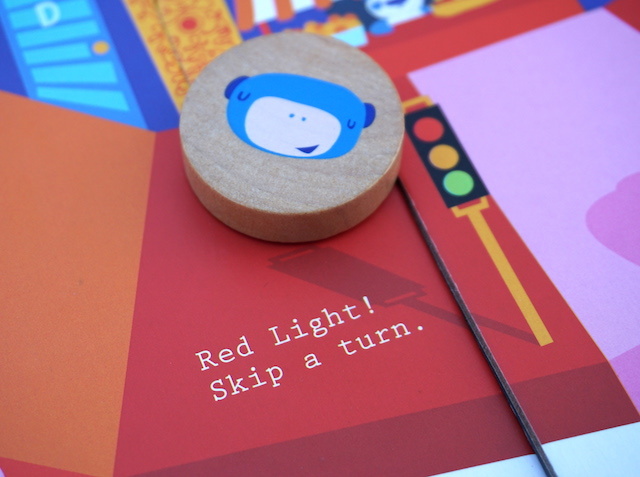 Silly Street from Wannaplé and Buffalo Games is a creative game for grownups and kids to play together. The first clue that Silly Street is not like other games is the setup. 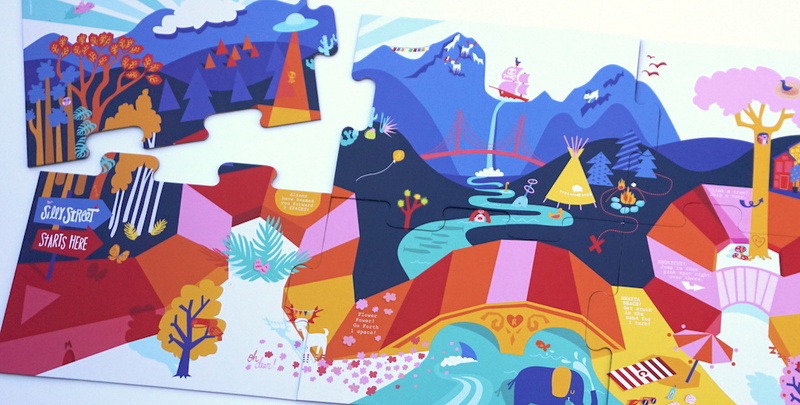 The board is an eight-piece giant floor puzzle. It’s not particularly hard, but if you’re in a rush, the order is printed on the back of the pieces. Once the board has been put together, each player chooses a token. 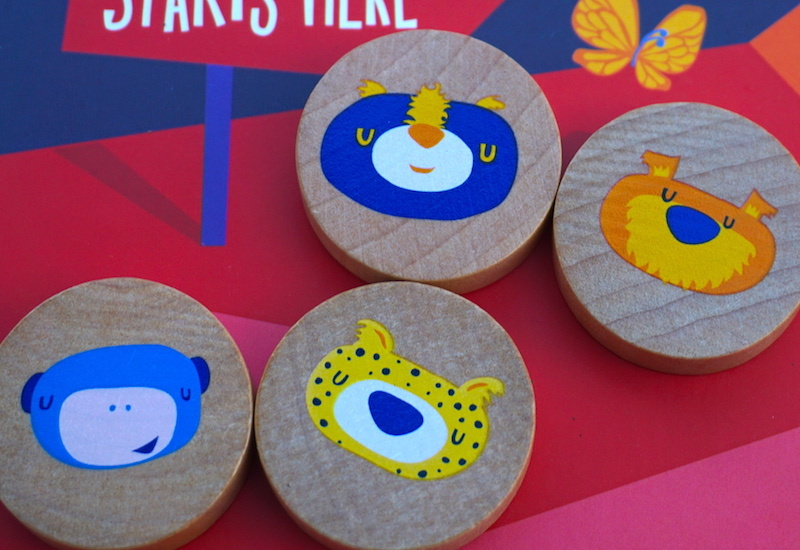 The tokens are chunky wooden discs – no worry about flimsy stands or bent cardboard (I’m looking at you, Chutes & Ladders). This will be the representation of the player as they move along the “street”. Gameplay is almost deceptively simple: draw a card, do what it says, then move your token the specified number of spaces on the “street”. The cards themselves are where the true silliness begins. 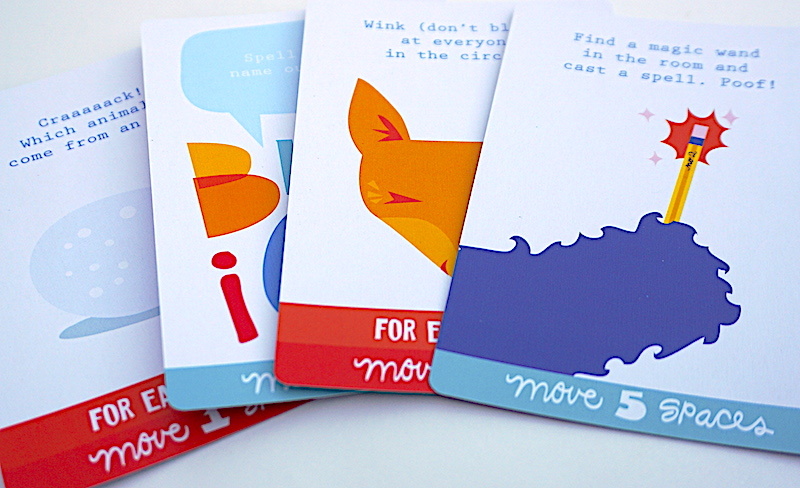 Howl like a wolf and move 4 spaces. Find animals on the board that hatch from eggs – move one space for each animal you found. Use something in the room as a mask. 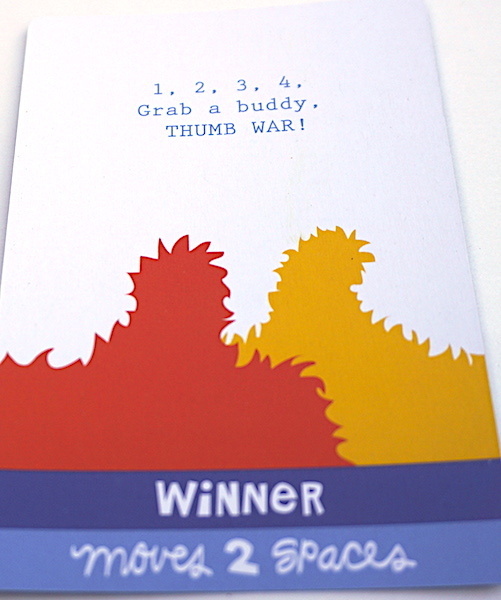 Have a thumb war, and only the winner moves. Clap and sing your favorite song in the world! Some of the cards strengthen academic skills (counting, spelling, memorization), but most of them are about building character. Players will build confidence, use their imaginations, and adapt to changing circumstances. Whoever makes it to the end of Silly Street first wins. The instructions recommend that the winner lead the group in a dance party. Celebrate! We enjoyed Silly Street. Unlike most of the games we review our toddler could be fully involved, although he did need help moving his token. Time for counting practice! 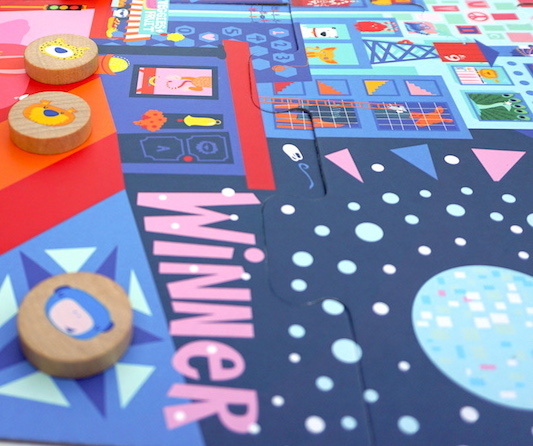 Although there is a winner Silly Street is the kind of game that rewards the journey. Every time we play the adults get silly, the kids get moving, and new topics get discussed. Like the track in most race games the “street” has a few spaces that bump players ahead or force them to lose a turn. We didn’t mind these too much, since play moved quickly. The kids loved drawing cards that allow them to decide who moves… but their favorite part was watching the grownups make fools of themselves. The biggest drawback for our family is that four tokens were not enough. We supplemented with a pawn from another game, but it would be nice if more were included. Stretching Silly Street out to support more players would be as simple as adding a couple more tokens. 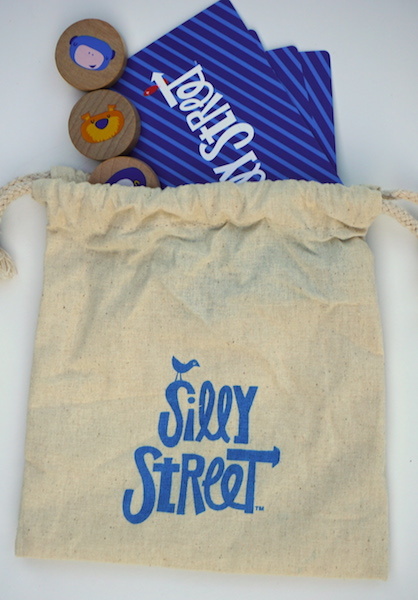 Silly Street is a fun game to get your whole family interacting, and it’s especially good for families that have a toddler or preschooler. We recommend playing a quick game after dinner. Pick it up at Amazon or Target and check PlaySillyStreet.com for more ideas on building character through play. The Family Gamers received a copy of Silly Street from Buffalo Games for review.